In 2012, journalist John Bohannon of the respected journal Science submitted a fictitious research paper to 304 open-access journals, of which 157 accepted his paper for publication. Bohannon used a fake name (Ocorrafoo Cobange) and a fake affiliation (Wassee Institute of Medicine); created a database of cancer cells, molecules, and lichens; and generated hundreds of unique papers using a computer program. The scientific content of each paper was identical and contained so many “grave errors that a competent peer reviewer should easily identify it as flawed and unpublishable” (Bohannon 2013). In March 2017, another respected journal, Nature, carried out its own sting operation. It submitted a fake application for an editor position, a person woefully unqualified, to 360 journals, a mix of legitimate journals and suspected predatory journals. Forty-eight of the latter accepted her for the job, many on condition of paying a fee or donation first (Sorokowski et al. 2017). Predatory journals can be defined as “publications [that take] large fees without providing robust editorial or publishing services.” They usually “recruit articles through aggressive marketing and spam emails, promising quick review and open access publication for a price. There is little if any quality control and virtually no transparency about processes and fees. Their motive is financial gain, and they are corrupting the communication of science. Their main victims are institutions and researchers in low and middle income countries…” (Clark and Smith 2015). Unfortunately, fake journals have increased aggressively and succeeded in establishing their positions in the world of academic writing, which may lead, if they remain unquestioned, to what Frank Truth calls “academic racketeering” (Truth 2012). In 2010, a librarian at the University of Colorado, Jeffrey Beall, developed a list of “predatory open-access journals” (Beall 2012; 2017). At the beginning, there were only twenty journals on his blacklist, but by 2013 the number exceeded 300 (Kolata 2013). One on Beall’s list of “questionable, scholarly open-access publishers” (Beall 2017) is the journal of choice among many of my undergraduate colleagues and even professors who used to be very happy when they received the acceptance letter and request to pay not more than $50. 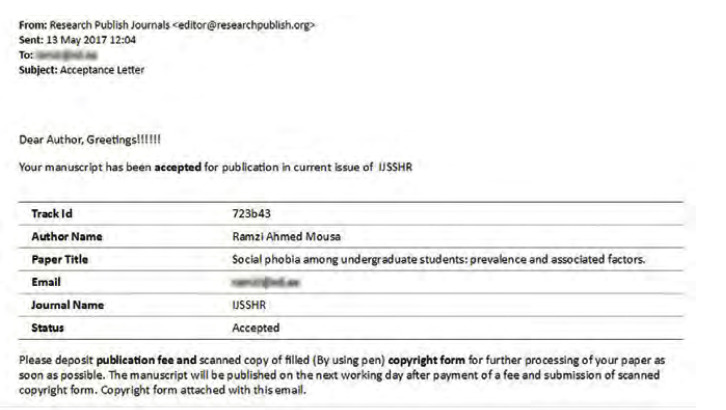 It seemed to me like charity, and I wanted to be one of those lucky international researchers publishing via this “Research Publish Journals” organization (http://www.researchpublish.com/). The first marketing bubble I found at researchpublish.com was this question “Why choose us?” I was very suspicious when I read one of their answers: “Presence of large numbers of if’s and buts in paper submission process of other Journals require lots of effort of authors unnecessarily.” I stopped reading and said to myself: “What a wonderful beginning!” As any English beginner would notice, there are many grammar and writing mistakes in addition to the poor writing quality. I was not shocked because I expected that. I continued reading, ignoring more and more terrible mistakes that should alert any serious researcher that he or she is probably going to waste their efforts and time by submitting a paper to such a journal. In scientifically sound and reputable journals there must be “ifs” and “buts.” A paper cannot be accepted for review until it passes many phases of checks and evaluations of its readiness to be peer-reviewed. However, predatory journals (such as Research Publish Journals) do not require good English, real affiliations, or even ethical clearance. They primarily “do not reject any paper!,” and to be considered, papers should only meet their easy “Research Publish Journals format.” So, what did I do? I used real data of mine and modified them to show clearly observable fatal mistakes in simple mathematics and English grammar. I also purposely kept many epidemiological facts without citations and declared that I do not have any ethical clearance. These clearly distinguishable flaws were generated to test a hypothesis that Research Publish Journals’ editorial board does not exist—or if it exists, it does not spend a second evaluating the submitted papers. The Same Day: I Will Be Rejected for Sure! My paper contained seriously fatal scientific flaws such as sampling errors, mathematically incorrect tables, uncited important data, and poor English. For example, in the abstract section the total sample was “700 undergraduate students” and the prevalence of X disease was “55.8%,” but in the methods and result sections, the total sample was “800” and “500,” and the prevalence of X disease was “25.8%.” As another example, in the ethical consideration section, I wrote: “Ethical clearance has not been obtained from the X University Ethical Committee.” In addition, I made simple grammatical mistakes such as “it are” and “they was,” which cannot be discovered by merely looking at the manuscript. Not to mention the other academic mistakes such as not citing references of the used scales, not reporting significant associations, and using scales of very poor internal consistencies (i.e., Cronbach alpha = 0.12). Surprisingly, despite all of those flaws, my paper was accepted the next day. I was shocked this time. My inbox contained an unread mail from Research Publish Journals <editor@researchpublish.org> with the subject line “Acceptance Letter.” Was I hallucinating? What kind of journal writes “Greetings!!!!! !” like that? Is it an automatic message? I had published a research article before. I received a message that had more informative content, such as: Dear (my name), Your manuscript titled (the study title) has been accepted… Attached is the final draft of your article. With regards. And they replied that they will send it to me before the publication. When? Apparently after they receive their $50 ASAP. Science is a great way to understand the world around us, to understand ourselves, and to understand others. Scientific papers are the language of science. Internet databases have a lot of good (and bad) published papers. There are papers designed to solve difficult problems in medicine, physics, and numerous other fields, and there are papers that are written just to be published somewhere without any real contribution to the growing scientific literature. If you are an author, please try to avoid journals that treat you like prey and do not respect your hard and time-consuming work. It is not paramount to get published as soon as possible. A good study must be reviewed by unbiased reviewers whose only goal is to tell you whether your paper is publishable or not. Getting published in a predatory journal may add some points to your CV, but it will affect your future career as an academic researcher and put you among fake researchers who contribute to the problem. So please try to publish in a real and reputable journal, even at the expense of your time and money. If you are a reader, you might not be aware of a lot of fake journals that look like real ones in everything, including the website design, language style, paper format, and “PhD” editors and contributors. Not every PDF file that has a large reference list is a scientific paper, so always be a suspicious reader. Well-regarded journals will be indexed in well-known libraries like PLoS and PubMed (Kolata 2013). I do not have commercial or any conflicts of interest with Research Publish Journals. One may wonder why I chose this journal among thousands of questionable publications on Beall’s list or other lists. The reason I reported my experience with this particular journal is that I knew that many of my colleagues and medical students in my country submit their well-written papers to them, just to pay less and get published in a short time. Beall, J. 2012. Predatory publishers are corrupting open access. Nature 489: 179 (September 13). doi:10.1038/489179a. ———. 2017. Bealls’s List of Predatory Journals and Publishers. Available online at http://beallslist.weebly.com; accessed June 16, 2017. Bohannon, J. 2013. Who’ s afraid of peer review? Science 342 (October 4): 60–65. Clark, J, and R. Smith. 2015. Firm action needed on predatory journals. BMJ 350: h210 (January). doi: 10.1136/bmj.h210. Kolata G. 2013. Scientific articles accepted (personal checks, too). New York Times (April 7): 6–9. Sorokowski, P., E. Kulczycki, A. Sorokowska, et al. 2017. Predatory journals recruit fake editor. Nature 543 (March 23): 481–482. doi:10.1038/543481a. Truth, F. 2012. Pay big to publish fast: Academic journal rackets. Journal of Critical Educational Studies 10 (Stratford): 54–105.